Base class for quad meshes (meshes made of 2D quad elements). Definition at line 61 of file quad_mesh.h. Definition at line 67 of file quad_mesh.h. Definition at line 70 of file quad_mesh.h. Definition at line 82 of file quad_mesh.h. Definition at line 76 of file quad_mesh.h. Setup lookup schemes which establish whic elements are located next to mesh's boundaries (wrapper to suppress doc). Definition at line 86 of file quad_mesh.h. 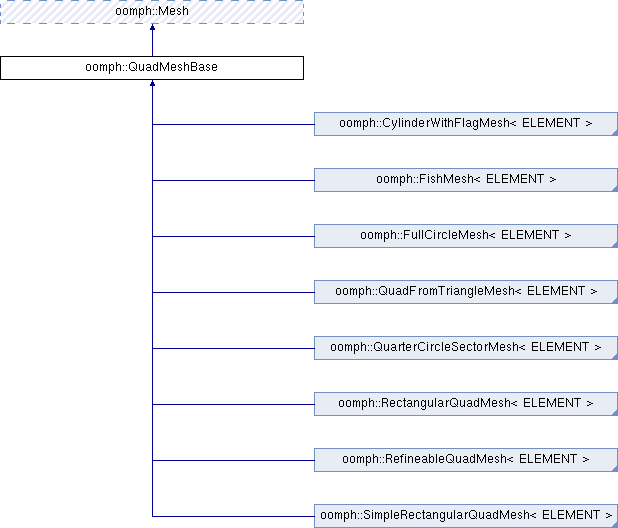 Referenced by oomph::ChannelWithLeafletMesh< ELEMENT >::ChannelWithLeafletMesh(), oomph::CollapsibleChannelMesh< ELEMENT >::CollapsibleChannelMesh(), oomph::FSIDrivenCavityMesh< ELEMENT >::FSIDrivenCavityMesh(), oomph::FullCircleMesh< ELEMENT >::FullCircleMesh(), and oomph::QuarterCircleSectorMesh< ELEMENT >::QuarterCircleSectorMesh(). Setup lookup schemes which establish whic elements are located next to mesh's boundaries. Doc in outfile (if it's open). Setup lookup schemes which establish which elements are located next to which boundaries (Doc to outfile if it's open). Definition at line 43 of file quad_mesh.cc. References oomph::Mesh::Boundary_element_pt, oomph::FiniteElement::dim(), oomph::LeakCheckNames::doc(), e, oomph::Mesh::Face_index_at_boundary, oomph::Mesh::finite_element_pt(), oomph::Node::get_boundaries_pt(), i, oomph::Mesh::Lookup_for_elements_next_boundary_is_setup, oomph::Mesh::nboundary(), oomph::Mesh::nelement(), oomph::FiniteElement::nnode_1d(), and oomph::FiniteElement::node_pt().